InLoox provides a print feature for every project view as well as for the project pages - all printing settings and features can be found in the dialog box print. You can use it to modify a document's print settings, or specify its watermark settings. Click on Print in the start tab to open the print preview. 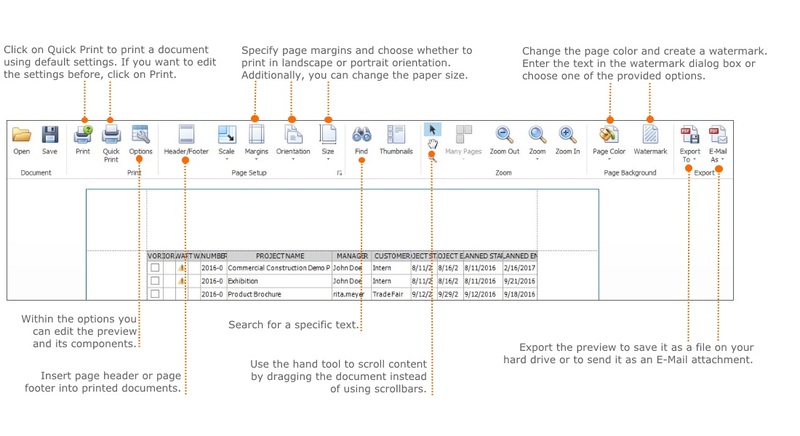 The following screenshot explains all important features that you can use to edit the print preview. To guarantee the ideal print of your document click on Scale and choose a suitable percentage from the drop-down menu. The scale feature enlarges or reduces the document in percentage to its current size. How to print the project list in InLoox 9 • Copyright 1999-2019 © InLoox, Inc. All rights reserved.